JANE: After we finished chatting last time, I realized that the film E.T. the Extra-Terrestrial is, in many ways, a response to Bug-Eyed Monster stories like The Thing. The film’s full title, since I didn’t mention it last time, is The Thing From Another World so there’s even a sort of parallel there. In both stories, a solitary alien is stranded on Earth and, presumably, would like to improve its situation. I say “presumably,” because we never do find out if The Thing is reacting from panic and fear (as Dr. Carrington, the chief scientist, believes) or from hostility (as the military folk believe). E.T. has enormous eyes, which definitely qualify him as “bug-eyed” (although “doe-eyed” is equally accurate). However, unlike most BEMs, he’s gentle, empathic, and intelligent. ALAN: That idea of the alien as allegory is a potent one. It’s a common literary device, used to reflect the zeitgeist. For example, Jack Finney’s pod people in Invasion of the Body Snatchers and Robert Heinlein’s parasitic puppet masters who ride their human hosts to death (in his novel The Puppet Masters) are clear dramatisations of the consequences of a communist takeover that America was so concerned with in the 1950s. Amusingly, in his novel A Plague of Pythons, the avowed left wing writer Frederik Pohl examined the same theme and came to much the same conclusion as Heinlein, who was writing from a right wing perspective. Pohl’s novel doesn’t have aliens in it (his puppet masters are human), but that only goes to show how symbolic the aliens actually are. JANE: That’s an interesting point! I hadn’t been aware of the unintentional agreement arrived at by two different approaches to the same theme. However, I do think that there’s a lot more to aliens than mere allegory. If they were only allegorical figures, I don’t think they’d have so much lasting appeal. And speaking of lasting appeal… You mentioned cute aliens. Are they really as prevalent as you said? I cudgeled my brain, but other than the Fuzzies and some aliens who fit more into the “companion animal category” (which I also think bears discussion) I couldn’t think of any right off the bat. ALAN: Thank you for reminding me. I think that cute aliens are a staple of SF. You mentioned Fuzzies and that’s probably the archetypal example. 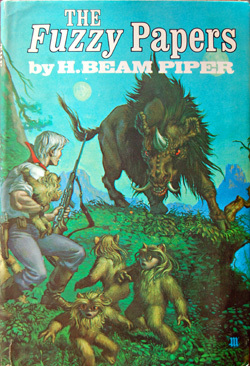 They appear in H. Beam Piper’s Little Fuzzy and its sequels (and John Scalzi has also written a Fuzzy novel). JANE: Indeed! Even housecats can be fierce, as the four who share my household go out of their way to remind me daily. However, now that I think about it, cute aliens are rather more common in movies and TV than in books. Ewoks spring immediately to mind, as do the tribbles from Star Trek. Though having said that, the tribbles owe a lot to Robert Heinlein’s flat cats from the novel The Rolling Stones (aka Space Family Stone). There’s a rather cute baby with squid-like tentacles in the movie Men In Black, but there’s also the squidmoth in Vonda McIntyre’s Starfarers novels which somehow manages to be both cute and alien at one and the same time. JANE: Interesting… “Cute” is definitely easier to do in a visual medium than in print. If you think about it, “cute aliens” are sort of the reverse of the “monster aliens.” Ewoks turned out to be nice, tribbles dangerous. And if one slides the scales over to pure monsters, the movie Gremlins shows both side of the question. ALAN: We SF geeks sometimes refer to aliens as “little green men” and there are some rather cute little green men in the movie Toy Story. JANE: Uh… It’s been years since I’ve seen the movie, but do you mean the little green army men? ALAN: No – the Little Green Men are prizes in a game of skill at Pizza Planet franchises. They are little, they are green, they have three eyes and an antenna sticking out of the top of their heads. The Little Green Men are all in telepathic communication with each other (presumably via the antenna). JANE: I remember now! Yes… They were definitely cute. ALAN: I’m also rather fond of the very funny (as well as cute and extremely annoying) little green men-Martians in Fredric Brown’s novel Martians Go Home! JANE: Henry Kuttner had some annoying cute aliens in one of his short stories… Darn! I’m blanking on the title. The story was one of the ones with his alcoholic genius character, who I didn’t care for, so I gave the book away… Can you remember? JANE: That’s them… Cute but really weird and creepy. I bet that the Lybblas were the inspiration for the aliens from the planet “Cuteatron” who appeared on a “Pigs in Space” portion of one of Jim Henson’s shows. ALAN: Jim Henson’s shows were marvelously science fictional. Wonderful stuff! But once we start looking at the cute alien theme more closely, don’t you find that it quickly segues into the “companion animal” kind of alien? JANE: That’s a fruitful topic and one for which I can think of quite a few examples. Let’s come back to it next time. This entry was posted on September 24, 2015 at 1:00 am and is filed under Random Wanderings. You can follow any responses to this entry through the RSS 2.0 feed. You can leave a response, or trackback from your own site. Do Poul Anderson and Gordon Dickson’s Hoka qualify as cute aliens, by any chance? Then there’s Willis the Bouncer in Heinlein’s Red Planet, which is a rather more complex case. Yes, I think the Hoka definitely qualify as cute. I’m pretty sure that was intentional — I vaguely remember reading somewhere that they deliberately tried for that effect. Yoda was kinda cute… Comparing E.T. to ’50s movies, there’s a bit where E.T. reaches out his elongated arm to touch Elliot on the shoulder. I think Spielberg was channeling 1953’s “War of the Worlds” where one of the Martians reaches out in similar fashion to touch the heroine, Sylvia, on the shoulder – with very different results. I like that thought… I’ve been reading a book with summaries of lots of old movies and filmmakers definitely seem inclined to that sort of internal dialogue between pieces.